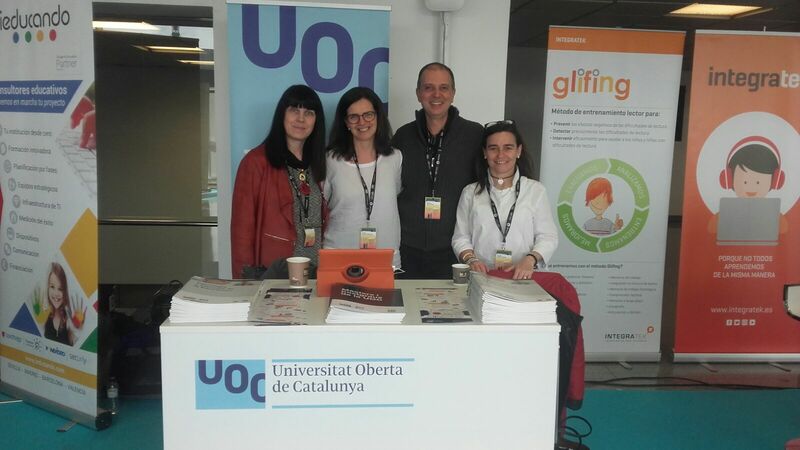 On 7 and 8 of March, the researchers Lourdes Guàrdia, Teresa Romeu, Marcelo Maina and Montse Guitert of the Edul@b research group have attended the congress ITworldEdu 9, organised by edutechcluster and held at the Palau de Congressos of Barcelona. The ITworldEdu focuses on the educational technology sector and aims to share technological developments, innovative educational experiences and ICT applications in teaching. It’s a space that intended to serve as a meeting point between teachers and companies of the ICT sector. In its ninth edition, the congress focused much of its interest in educational transformation and in how ICTs favor teaching /learning processes, the role of the industry sector in responding to the transformative school and being an essential partner in this process of transformation and generation of an advanced educational ecosystem, and best practices in the classroom. The presentations and videos of the different presentations made at the congress will be available soon on the ITworldEdu website.